LAS VEGAS -- Imprisoned former football star O.J. Simpson has a July 20 parole hearing that could have him released from a Nevada prison on Oct. 1, a state parole official said Tuesday. Simpson, now 70, has served more than eight years of a nine-to-33 year sentence imposed after he was found guilty in 2008 of armed robbery, kidnapping and other charges stemming from a confrontation with two sports memorabilia dealers at in a Las Vegas casino hotel room in September 2007. Simpson is due to appear by videoconference from Lovelock Correctional Center, where he is being held, before a panel of four parole commissioners sitting in Carson City, parole official David Smith said. Simpson's attorney in Las Vegas, Malcolm LaVergne, said he will be with his client at the medium-security prison in a small town 90 miles northeast of Reno. "If he's able to get parole, my prediction is he's going to want to live a quiet life," LaVergne said in a recent interview. LaVergne declined additional comment until after the proceeding. One of Simpson's trial lawyers, Yale Galanter, said Tuesday he hasn't been in contact with Simpson since Simpson lost a bid for a new trial in 2013 based on a claim that Galanter botched his defense. "From everything I hear, he's been a model prisoner," Galanter said. "I hope it all works out and he's released." Simpson's other trial lawyer, Gabriel Grasso, declined to comment. Simpson has been to the parole board before. In July 2013, he told commissioners he regretted the encounter with the collectibles dealers in Las Vegas and said he had apologized to them. He said he kept a promise to prison officials to set an example for other inmates, whom he said he mentored and counseled when they came to him with issues. The board noted Simpson had no disciplinary actions during his incarceration and was deemed a low risk for repeat offenses. It granted Simpson parole on some convictions, leaving him with least four more years before his minimum nine-year sentence was reached. "My crime was trying to retrieve for my family my own property," Simpson said at the time. 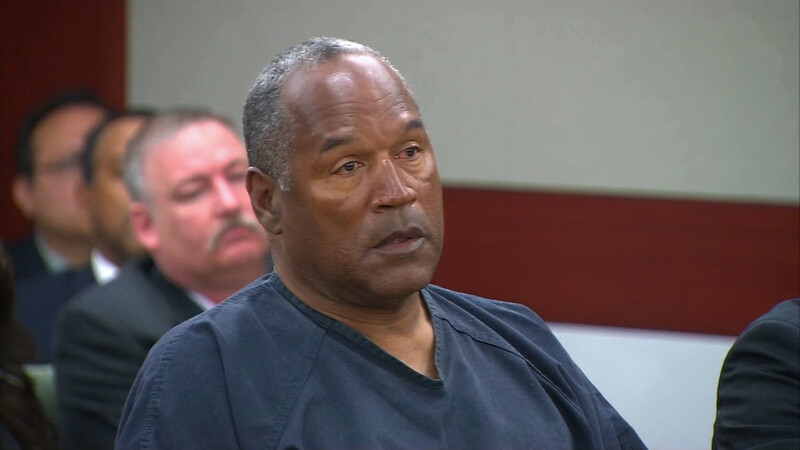 Simpson has always maintained he was trying to retrieve personal mementoes stolen from him following his 1995 acquittal in the killings of his ex-wife, Nicole Brown Simpson, and her friend Ronald Goldman in Los Angeles. He said family photos and other items disappeared before a judge in February 1997 found him liable for the deaths of Goldman and Nicole Brown Simpson and ordered him to pay $33.5 million to their estates. Ten years later, the hall-of-fame football star, actor and advertising pitchman was living in Miami when he traveled to Las Vegas for a friend's wedding. He and several friends hatched a plan between drinks around a casino resort swimming pool to have five men accompany Simpson and a middleman to meet Alfred Beardsley and Bruce Fromong in a room at the Palace Station hotel-casino. Beardsley died in November 2015. Fromong said he suffered financially and physically, including four heart attacks, and vividly remembers having a gun pointed at him. He said he wants to attend Simpson's hearing, but he said he doesn't know what he'll say. "I've lost everything,"Fromong said. "But I don't want to live my life in the past." Simpson and five others were arrested. Four co-defendants pleaded guilty before trial to felony charges and testified for the prosecution. Two told jurors they brought and displayed guns, although Simpson insisted he never knew anyone was armed. Simpson and Clarence "C.J." Stewart stood trial. Both were found guilty in October 2008 of charges also including assault with a deadly weapon, burglary and conspiracy. Stewart was sentenced to 7 to 27 years in state prison. He served 27 months before the Nevada Supreme Court ruled that Simpson's fame tainted the jury and that Stewart should have been tried separately. Stewart avoided a retrial by pleading an equivalent of no contest to felony robbery and conspiracy. He was sentenced to probation.